” We hear so much at this time of year about New Year’s resolutions – eat healthy, quit smoking, get more exercise, drink more water. The list goes on and on and on. While these are all valid and well intentioned goals, I am urging you to do one simple thing for your health in 2018 which could save your life. ” High blood pressure, also referred to as hypertension, is a major risk factor for stroke, coronary heart disease, heart failure, kidney disease, deteriorating vision and peripheral vascular disease leading to leg ulcers and gangrene. Based on both measured and self-reported data from the 2012–13 Health Survey, 27% of Indigenous adults had high blood pressure. Rates increased with age and were higher in remote areas (34%) than non-remote areas (25%). Twenty per cent of Indigenous adults had current measured high blood pressure. Of these adults, 21% also reported diagnosed high blood pressure. Most Indigenous Australians with measured high blood pressure (79%) did not know they had the condition; this proportion was similar among non-Indigenous Australians. Therefore, there are a number of Indigenous adults with undiagnosed high blood pressure who are unlikely to be receiving appropriate medical advice and treatment. The proportion of Indigenous adults with measured high blood pressure who did not report a diagnosed condition decreased with age and was higher in non-remote areas (85%) compared with remote areas (65%). Cardiovascular disease is the leading cause of death for Aboriginal and Torres Strait Islander people, who experience and die from cardiovascular disease at much higher rates than other Australians. ACCHO’s focusing on primary prevention through risk assessment, awareness and early identification and secondary prevention through medication. “High blood pressure is a silent killer because there are no obvious signs or symptoms, the only way to know is to ask your ACCHO GP for regular check-ups. Uncontrolled high blood pressure is one of the greatest preventable risk factors that contributes significantly to the cardiovascular disease burden. Stroke is a devastating disease that will impact one in six of us. There is one stroke every nine minutes in Australia. Stroke attacks the human control centre – the brain – it happens in an instant and changes lives forever. In 2018 it’s estimated there will be more than 56,000 strokes across the country. Stroke will kill more women than breast cancer and more men than prostate cancer this year. But the good news is that it does not need to be this way. Up to 80 percent of strokes are preventable, and research has shown the number of strokes would be practically cut in half (48 percent) if high blood pressure alone was eliminated. Around 4.1 million of us have high blood pressure and many of us don’t realise it. Unfortunately, high blood pressure has no symptoms. The only way to know if it is a health issue for you is by having it checked by your doctor or local pharmacist. Make having regular blood pressure checks a priority for 2018. Include a blood pressure check in your next GP visit or trip to the shops. Be aware of your stroke risk and take steps to manage it. Do it for yourself and do it for your family. If you think you are too young to suffer a stroke, think again. 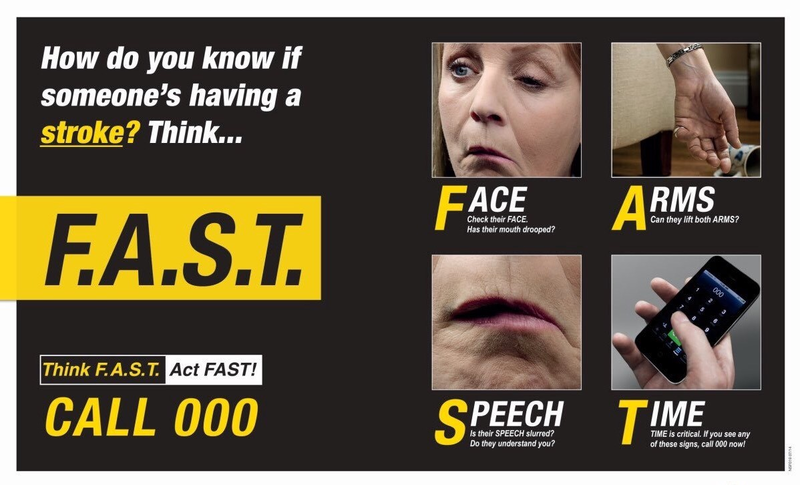 One in three people who has a stroke is of working age. Health and fitness is big business. But before you fork out big bucks on a personal trainer or diet plan this year, do something simple and have your blood pressure checked. It will only take five minutes, it’s non-invasive and it could save your life. In 2012–13, 10% of Indigenous adults reported they had a diagnosed high blood pressure condition. Of these, 18% did not have measured high blood pressure and therefore are likely to be managing their condition. 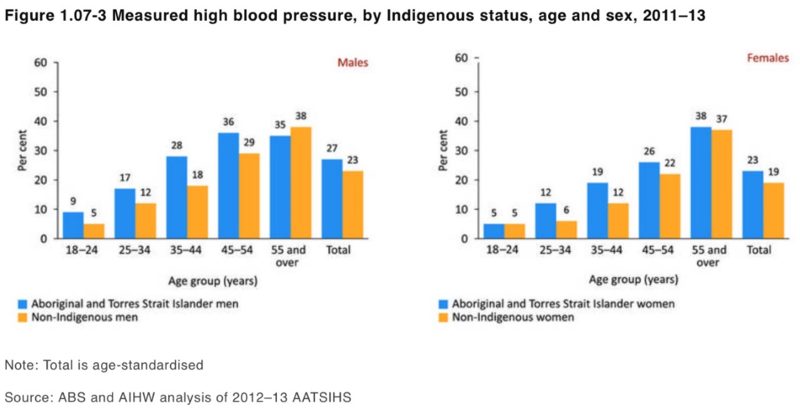 Indigenous males were more likely to have high measured blood pressure (23%) than females (18%). The survey showed that an additional 36% of Indigenous adults had pre-hypertension (blood pressure between 120/80 and 140/90 mmHg). This condition is a signal of possibly developing hypertension requiring early intervention. In 2012–13, after adjusting for differences in the age structure of the two populations, Indigenous adults were 1.2 times as likely to have high measured blood pressure as non-Indigenous adults. For Indigenous Australians, rates started rising at younger ages and the largest gap was in the 35–44 year age group. Analysis of the 2012–13 Health Survey found a number of associations between socio-economic status and measured and/or self-reported high blood pressure. Indigenous Australians living in the most relatively disadvantaged areas were 1.3 times as likely to have high blood pressure (28%) as those living in the most relatively advantaged areas (22%). Indigenous Australians reporting having completed schooling to Year 9 or below were 2.1 times as likely to have high blood pressure (38%) as those who completed Year 12 (18%). Additionally, those with obesity were 2 times as likely to have high blood pressure (37% vs 18%). Those reporting fair/poor health were 1.8 times as likely as those reporting excellent/very good/good health to be have high blood pressure (41% vs 22%). Those reporting having diabetes were 2.2 times as likely to have high blood pressure (51% vs 23%), as were those reporting having kidney disease (57% vs 26%). One study in selected remote communities found high blood pressure rates 3–8 times the general population (Hoy et al. 2007). Most diagnosed cases of high blood pressure are managed by GPs or medical specialists. When hospitalisation occurs it is usually due to cardiovascular complications resulting from uncontrolled chronic blood pressure elevation. During the two years to June 2013, hospitalisation rates for hypertensive disease were 2.4 times as high for Aboriginal and Torres Strait Islander peoples as for non-Indigenous Australians. Among Aboriginal and Torres Strait Islander peoples, hospitalisation rates started rising at younger ages with the greatest difference in the 55–64 year age group. This suggests that high blood pressure is more severe, occurs earlier, and is not controlled as well for Indigenous Australians. As a consequence, severe disease requiring acute care in hospital is more common. GP survey data collected from April 2008 to March 2013 suggest that high blood pressure represented 4% of all problems managed by GPs among Indigenous Australians. After adjusting for differences in the age structure of the two populations, rates for the management of high blood pressure among Indigenous Australians were similar to those for other Australians. 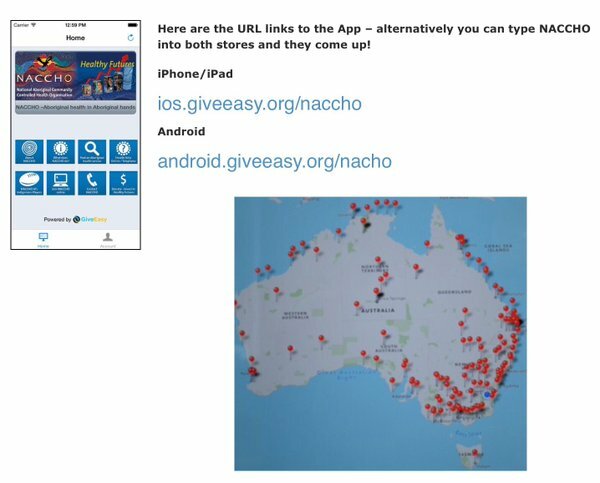 In December 2013, Australian Government-funded Indigenous primary health care organisations provided national Key Performance Indicators data on around 28,000 regular clients with Type 2 diabetes. In the six months to December 2013, 64% of these clients had their blood pressure assessed and 44% had results in the recommended range (AIHW 2014w). The prevalence of measured high blood pressure among Indigenous adults was estimated as 1.2 times as high as for non-Indigenous adults and hospitalisation rates were 2.4 times as high, but high blood pressure accounted for a similar proportion of GP consultations for each population. This suggests that Indigenous Australians are less likely to have their high blood pressure diagnosed and less likely to have it well controlled given the similar rate of GP visits and higher rate of hospitalisation due to cardiovascular complications. Research into the effectiveness of quality improvement programmes in Aboriginal and Torres Strait Islander primary health care services has demonstrated that blood pressure control can be improved by a well-coordinated and systematic approach to chronic disease management (McDermott et al. 2004). Identification and management of hypertension requires access to primary health care with appropriate systems for the identification of Aboriginal and Torres Strait Islander clients and systemic approaches to health assessments and chronic illness management. The Indigenous Australians’ Health Programme, which commenced 1 July 2014, provides for better chronic disease prevention and management through expanded access to and coordination of comprehensive primary health care. 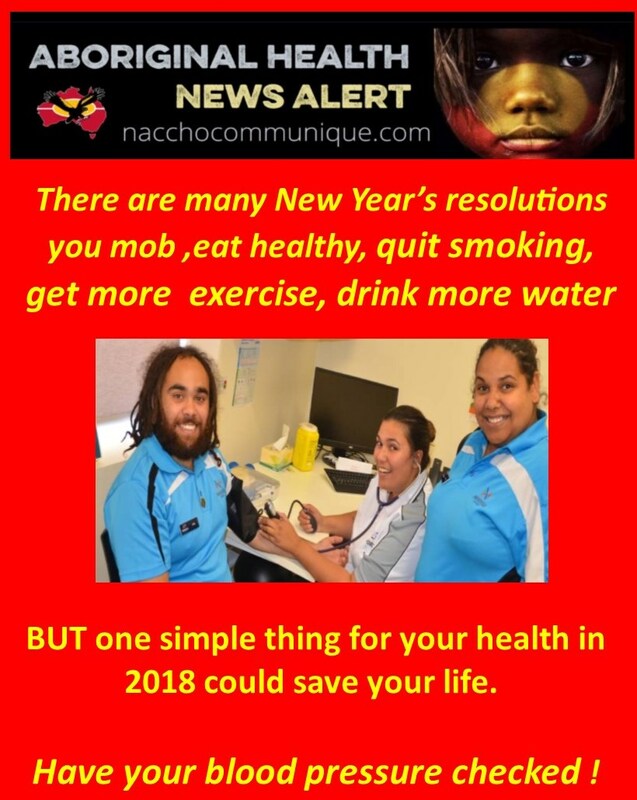 Initiatives provided through this programme include nationwide tobacco reduction and healthy lifestyle promotion activities, a care coordination and outreach workforce based in Medicare Locals and Aboriginal Community Controlled Health Organisations and GP, specialist and allied health outreach services serving urban, rural and remote communities, all of which can be used to diagnose and assist Indigenous Australians with high blood pressure. Additionally, the Australian Government provides GP health assessments for Indigenous Australians under the MBS, of which blood pressure measurement is one key element, with follow-on care and incentive payments for improved management, and cheaper medicines through the PBS. The Australian Government-funded ESSENCE project ‘essential service standards’ articulates what elements of care are necessary to reduce disparity for Indigenous Australians for high blood pressure. This includes recommendations focusing on primary prevention through risk assessment, awareness and early identification and secondary prevention through medication. 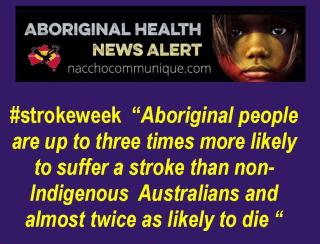 ” Aboriginal and Torres Strait Islander people are up to three times more likely to suffer a stroke than non-Indigenous Australians and almost twice as likely to die, according to the Australian Bureau of Statistics. It’s an alarming figure and one that prompted the National Stroke Foundation in 2016 to urge the Federal Government to fund a critical $44 million awareness campaign in a bid to close the gap . The good news is most strokes are preventable and treatable. When I woke up, I didn’t know what was going on. I couldn’t communicate. I couldn’t tell anyone I was still here. It was really scary. I’d never seen the effects of a stroke. First, I lost my voice, then my vision, my [ability to] swallow and my movement of all my body parts. I lost all my bowel and bladder function. I’ve still got bad sight but I can see again. My speech took about six months. For Tania Lewis, an Awabakal woman, stroke was something that only happened to older people. But in 2011, Tania suffered a severe stroke at the age of 39 that would leave her with permanent right-sided hemiplegia – paralysis of one side of the body. A stroke occurs when supply of blood to the brain is disturbed suddenly. The longer it remains untreated, the heightened the risk of stroke-related brain damage. Medical treatment during the first onset of symptoms can significantly improve a sufferer’s chance of survival and of successful rehabilitation. But in 2011, Tania suffered a severe stroke at the age of 39 that would leave her with permanent right-sided hemiplegia – paralysis of one side of the body. The burden of stroke doesn’t just fall on the patient, but can take a significant toll on family and carers. “The doctor at the hospital tried to take Power of Attorney and Guardianship away from me and give it to the Guardianship Board, because he didn’t believe that [my husband] Len or anyone could look after me,” Tania recalls. “I was put through hell. I figured life wasn’t worth living anymore because they took everything away from me. I couldn’t go home to my family. So I tried to off myself. Tania spent the next two and a half years between three aged care facilities. “I wouldn’t wish it upon nobody,” she says. It was during her nightly ritual of chatting with her daughter via Facebook that Tania typed “young people in nursing homes” into Google. The search engine’s results would lead to her life-changing encounter with the YPINH. 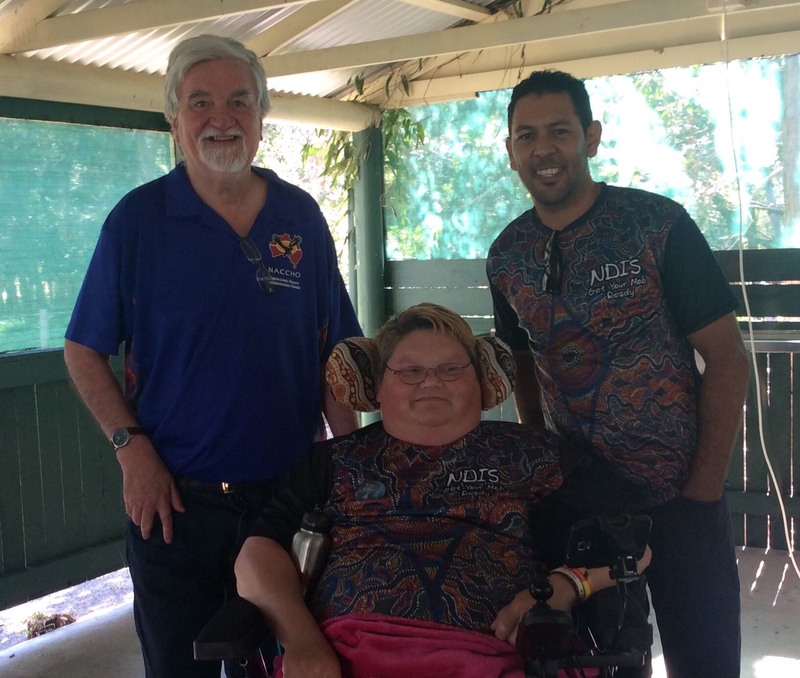 Today, Tania is working with the Aboriginal Disability Network, helping Indigenous Australians navigate their way through the National Healthcare System. It has long been recognised that Aboriginal and Torres Strait Islander people have a life expectancy that is approximately 20 years less than non-Indigenous Australians (Australian Bureau of Statistics). Recent data from the ABS shows that up to 80 per cent of the mortality gap can be attributed to chronic diseases such as heart disease, stroke, diabetes and kidney disease. For many Aboriginal communities, especially those in remote regions, socio-economic factors play an important role. Kerin O’Dea from Darwin’s Menzies School of Health Research cites unemployment, poor education outcomes and limited access to fresh foods as key factors in her paper, Preventable chronic diseases among Indigenous Australians. Lifestyle related risks such as smoking, alcohol misuse, stress, poor diet, and inadequate physical activity also need to be addressed, according to the Australian Institute of Health and Welfare . But the first step, McGowan says, is for indigenous stroke sufferers to recognise the signs of a stroke in themselves and their family members. The NSF recommends the F.A.S.T. test as the most effective way to remember the most common signs of a stroke. “If I had known that because I’d lost my vision I had suffered a stroke, I could’ve put two and two together and got help, but I didn’t know anything,” Tania says. The Stroke Foundation called on the Federal Government to fund an urgent $44 million campaign to address the gap in stroke care. For more information on stroke and the campaign, visit strokefoundation.com.au. The incidence rate of stroke for Aboriginal and Torres Strait Islander Australians has been found to be 2.6 times higher for men and 3.0 for women (Australian Institute of Health and Welfare, 2008; Katzenellenbogan et al. 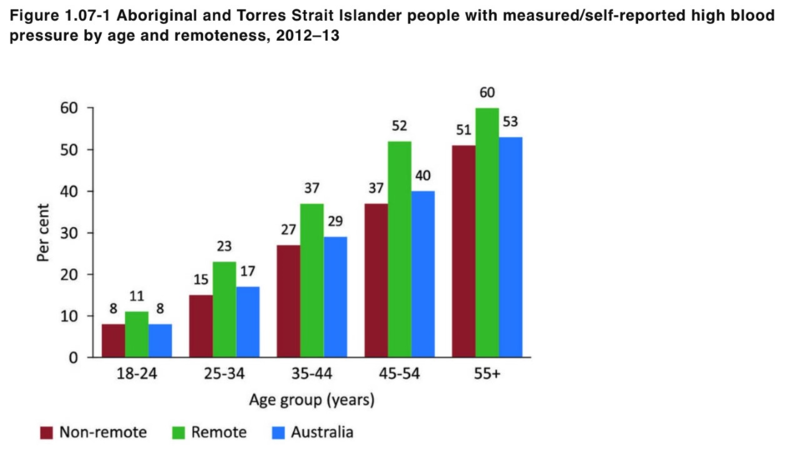 2010) compared to non-Aboriginal and Torres Strait Islander Australians and many suggest that these figures may in fact be underestimates (Thrift et al 2011). 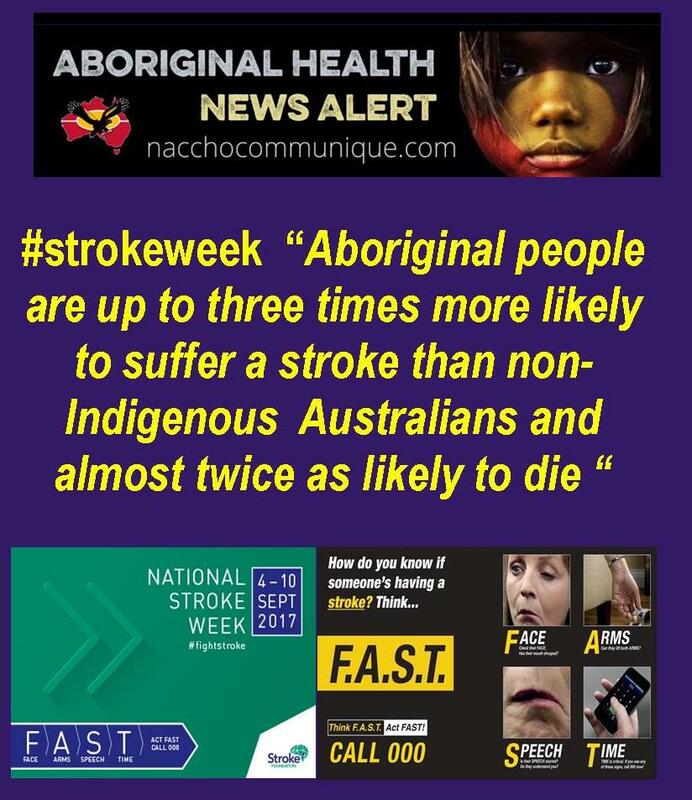 Aboriginal and Torres Strait Islander Australians are known to experience stroke at a younger age than their non-Aboriginal and Torres Strait Islander counterparts, (Katzenellenbogen et al., 2010; Australian Institute of Health and Welfare, 2004) with 60% of Aboriginal and Torres Strait Islander non-fatal stroke burden occurring in the 25-54 year age-group compared to 24% in the non-Aboriginal and Torres Strait Islander group (Katzenellenbogen et al., 2010). The prevalence of stroke is similarly significantly higher at younger ages among Aboriginal and Torres Strait Islander people (Katzenellenbogen 2013), with a significantly higher prevalence of co-morbidities among Aboriginal and Torres Strait Islander patients under 70 years of age, including heart failure, atrial fibrillation, chronic rheumatic heart disease, ischaemic heart disease, diabetes and chronic kidney disease. This reflects the increased clinical complexity among Aboriginal and Torres Strait Islander stroke patients compared with non-Aboriginal/Torres Strait Islander patients. Aboriginal and Torres Strait Islander stroke patients aged 18–64 years have a threefold chance of dying or being dependent at discharge compared to non-Aboriginal and Torres Strait Islander patients (Kilkenny et al., 2012).